The idea was to start our Arab Artists adventure with something extra special, with someone that could get us moving on the right foot, and that person turned out to be celebrated author and journalist Amin Maalouf. 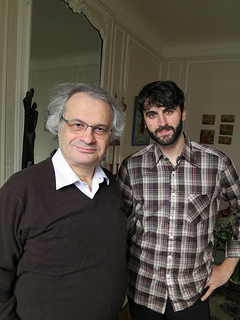 So before flying down to Tunis, Chris and I met up in Paris for 2 days of preparation and conversation. 2 days during which, it turned out, we would get to spend some quality time with a very wise man and his inspiring family. We were scheduled to meet for a morning session; a long interview covering the middle east in the present, recent past, and much more. We hoped to talk history, arts, politics, and enjoy the life stories Amin might bring forth. But instead of waiting for that morning appointment, the night before Chris tells me “we should just go over there, drop by, say hello, and see if we can’t get some ideas out for him to sleep on.” My immediate reaction, even though I should realize Chris has been doing this very many decades, was to remind him that people are busy on Saturday nights, and he won’t be home (or he doesn’t want to see us until our agreed appointment). We arrive at the address and sure enough realize we didn’t bring that essential Parisian tool, the door code. We stand at the door, periodically crossing the street and looking up at the window as if someone will look down and yell — “Oh its you guys, come on up!” – Right around then a neighbor opens the door and invites us in, “who are you looking for?” — Mr Maalouf, I explain. The woman doesn’t hesitate as she points me to the appropriate hallway. 30 seconds later, we’re warmly greeted by the sweetest couple that must have been a little shocked at this inter-generational journalist duo that just wandered in off the street. In his relaxed around the house clothes, Amin sat with us in the living room and immediately began to talk about a projects he is working on, people we have in common, and the latest updates about the US election race. Not 12 hours later we are back in that same living room. This time Mr. Maalouf is sitting in the living room dressed nicely as I’ve often seen on BBC programs where he is interviewed. He’s been thinking about some of the things we talked about, and just as I figure out the ins and outs of Chris’s recorder, off we go on a 2+ hour journey through time and space. I kept expecting him to run off needing water or to answer a phone, but instead he stays with us and considers every question carefully. It was both exciting and exhausting as I reviewed in my head, every idea he put forward. The whole discussion was already a massive success in my mind. But just when i though it couldn’t get any better, Mrs. Maalouf comes to get us, to make a plate and join the family for lunch. Now we’re launched into conversations and creative back and forth idea sharing, as the rest of the family is just as kind and engaging as the man himself. It was as if I was speaking with old friends who have long been working on similar ideas. Combine that with the best Lebanese food imaginable, and you get an afternoon that I hoped would never end.